I acknowledge that it is January 31, so you probably aren't thinking about Christmas ornaments anymore. But it is still winter, and surely it's snowing somewhere in the US, right? So this post is not completely out of season... In December I made a handful of nameflake ornaments using a new style! Back in May I got some Accuquilt GO! 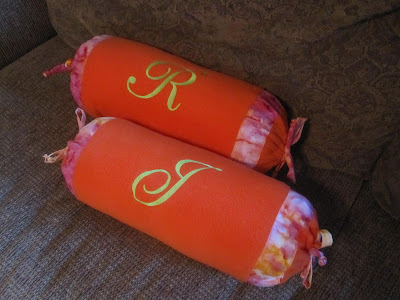 rag dies for my birthday and had been anxious to use them, particularly the circle rag die. 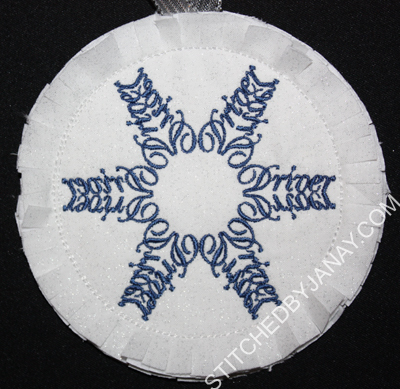 I wanted to experiment with it to see if I could speed up the process of making the completed ornament. 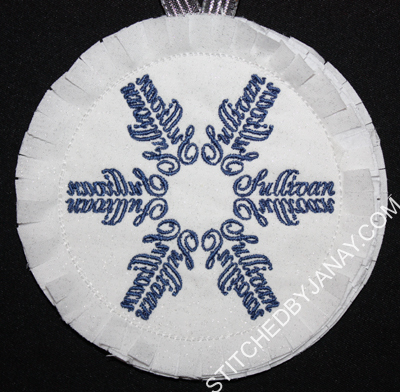 All my past nameflake ornaments have been like this one with satin stitches around the outside edge. 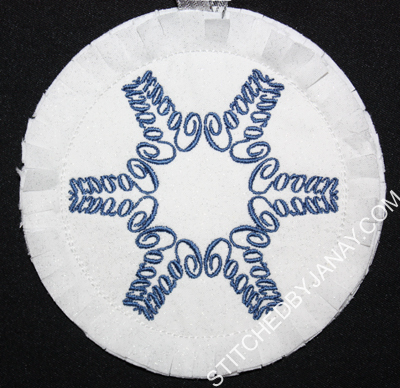 I like the look, but frankly it's time consuming to mass produce these -- carefully trimming out the circles on top and bottom, then waiting for the satin stitches to run, then carefully removing the stabilizer... I wanted a quicker method. And thankfully the rag die worked out to be the perfect solution! 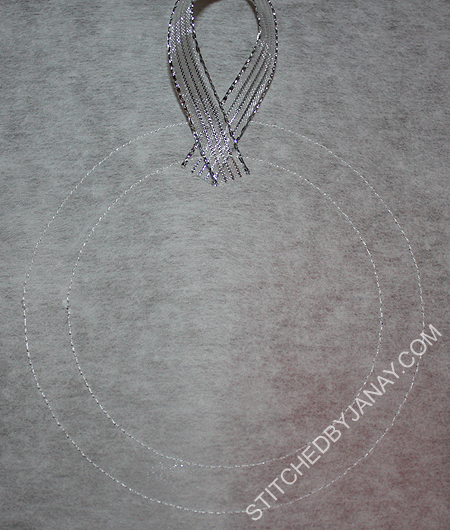 I laid a piece of my sparkly white fabric on top of a layer of white flannel and cut out the rag circle. (I did this twice for each ornament.) 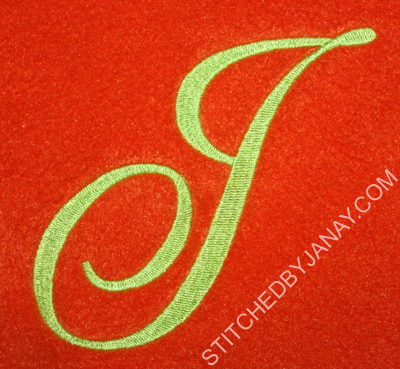 Then I went to my embroidery machine. 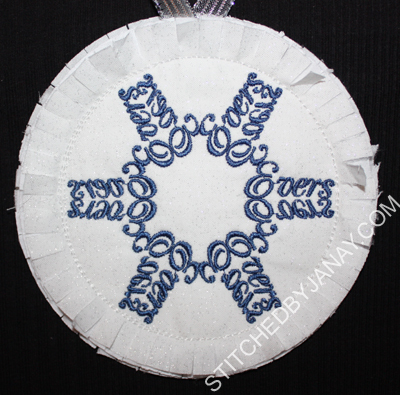 I ran a placement stitch the size of circle (4.75" wide), and then tacked down a ribbon hanger. 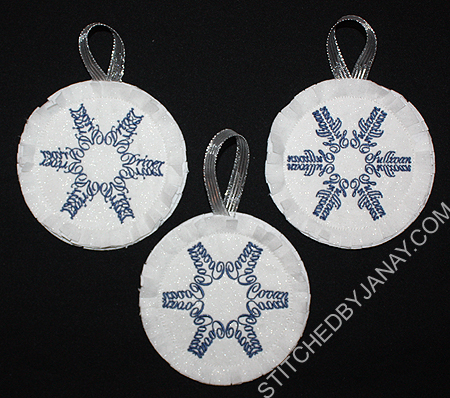 In past years when I've shared pictures of my nameflake ornaments (you can see my gallery on Facebook) I got questions asking how to make them. 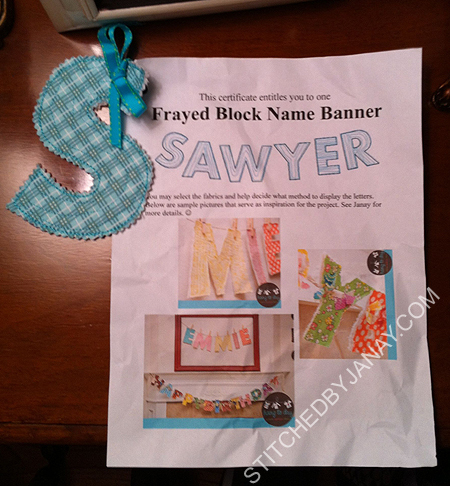 I promised a tutorial on an Embird yahoo group, and finally delivered it this fall. The free tutorial is in pdf form, and outlines the process with lots of images for creating a nameflake in Embird. It doesn't not require Studio or Font Engine, although I do highly recommend using Alphabet #38 for the project. If you would like to have a copy of the tutorial, all you need to do is join the Embird101 yahoo group. Once accepted, you can find the pdf in Files -> Mini Lessons. If you use Embird, this group is a phenomenal resource. The list mom Peggy of Pegboard Crafts is an expert who graciously answers questions from installation to digitizing details. You will not be disappointed, and the group can offer more Embird support/troubleshooting than I am able to give. :) Enjoy! 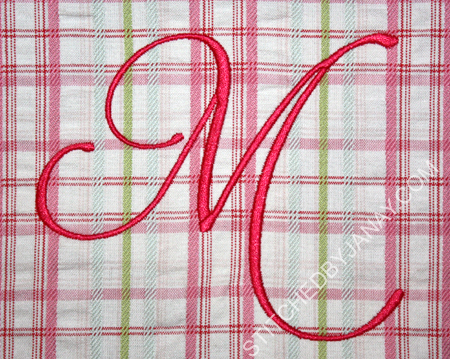 Random project share time... miscellaneous monogramming from December! Blankets for Melissa to give to her sons and daughter-in-law. 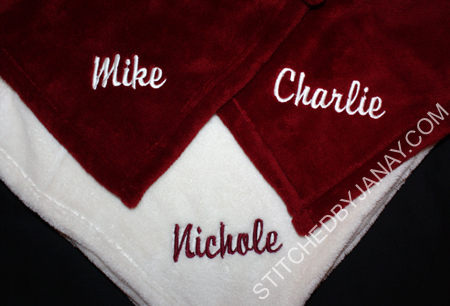 These were super soft and I was tempted to "accidentally" put my name on one! 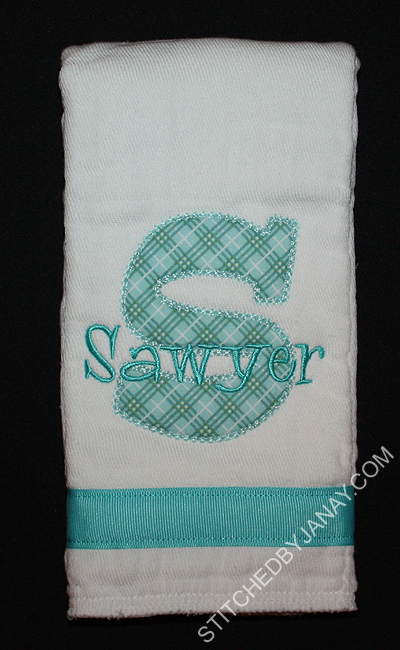 The Williams family grew by two this year when their adoption was finalized, so the younger boys needed stockings! This is a terrible picture, they looked so much prettier in person! I have been dying to use these Riley Blake plaids for boy/girl sibling designs and jumped on the opportunity to do it now. 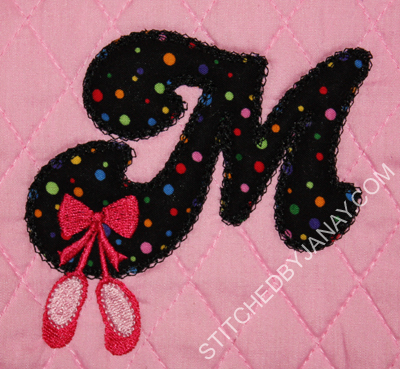 I used Embroidery Boutique's Fun Applique Alphabet (capital A and lower case s), and added the text with Embird Alphabet #14. Michelle is always coming up with clever ideas! 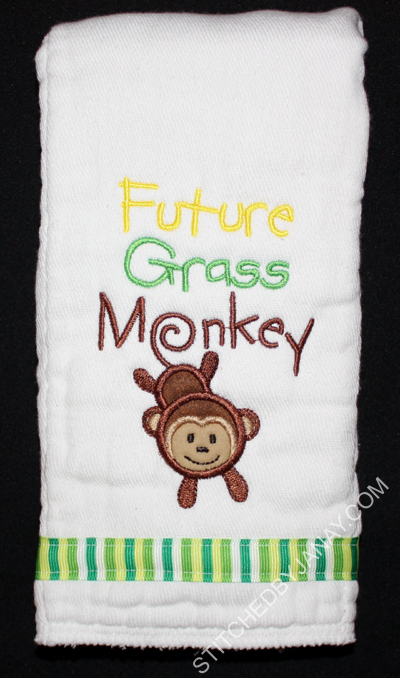 Daddy Raymond owns his own lawn care company called "Grass Monkeys" and she wanted a burp cloth to reflect that. 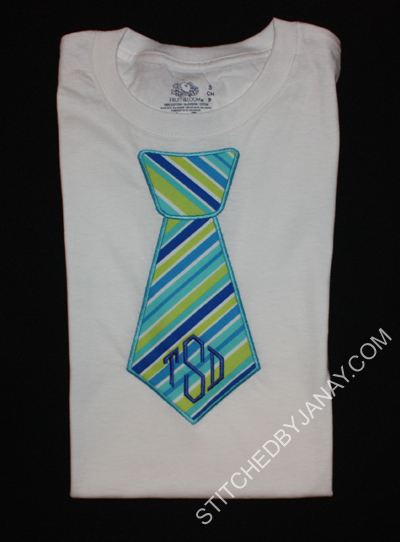 She created this idea herself -- she found the Lucky Monkey design on Lynnie Pinnie's site and suggested the change in text/font. It turned out so cute!! Then we went fabric shopping together to find exactly what she wanted. 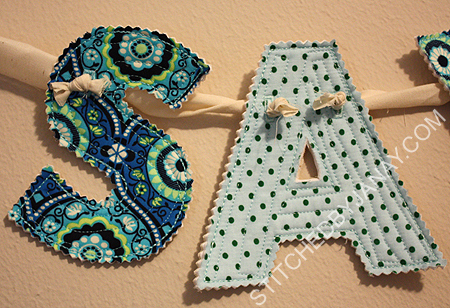 She decided to alternate two fabrics -- the thought of picking out six coordinating fabrics was too overwhelming. 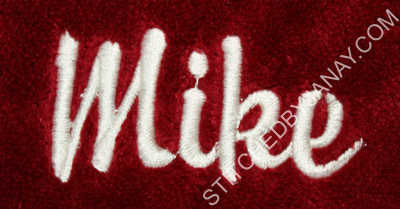 ;) Here's the final banner (hanging in my bedroom... 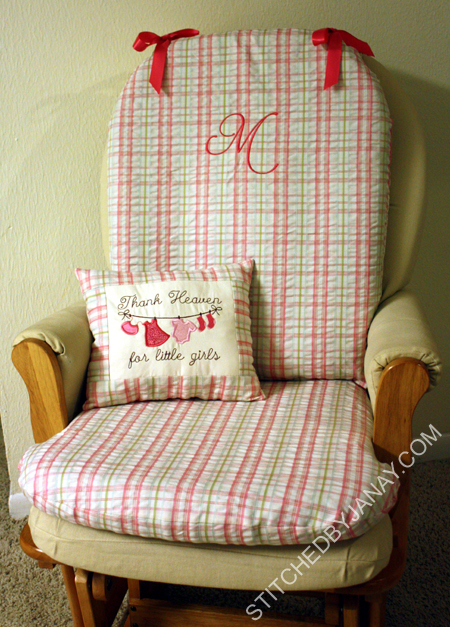 I will update with better nursery pictures later). 2. 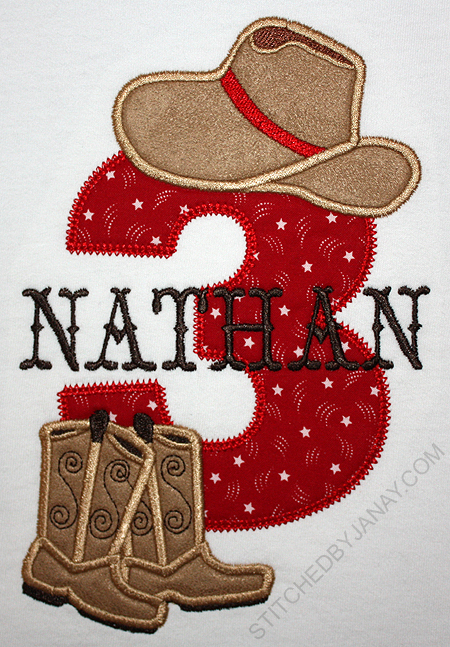 Applique designs from Lynnie Pinnie -- both the cowboy hat and boots are hers. 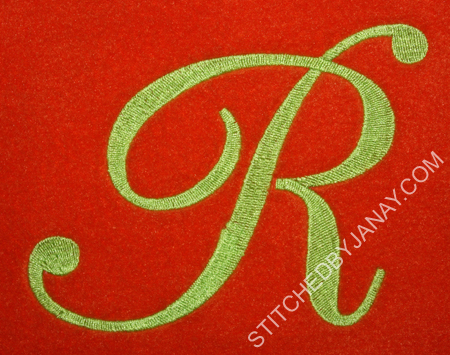 They are designed to use two fabrics but for simplicity I just used one, a neat suede-like material. 3. 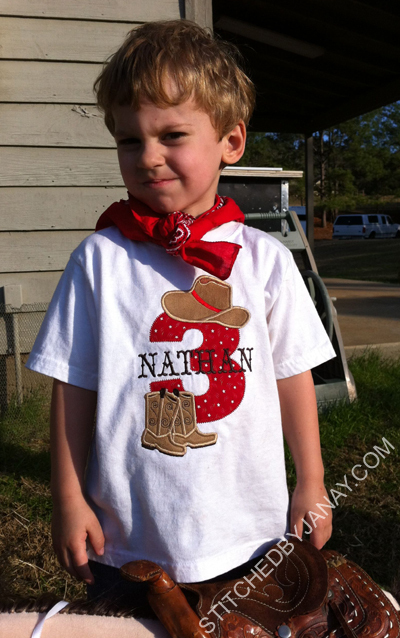 Fonts from 8 Claws and a Paw -- this one is Hoedown. 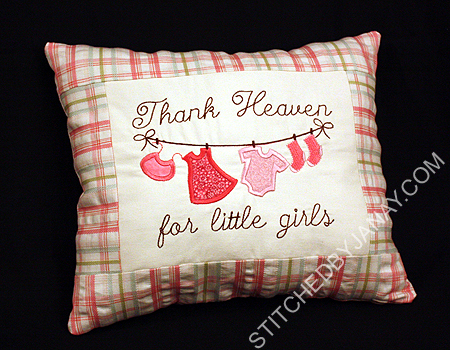 I used the largest size of the "Thank Heaven for little girls" design. 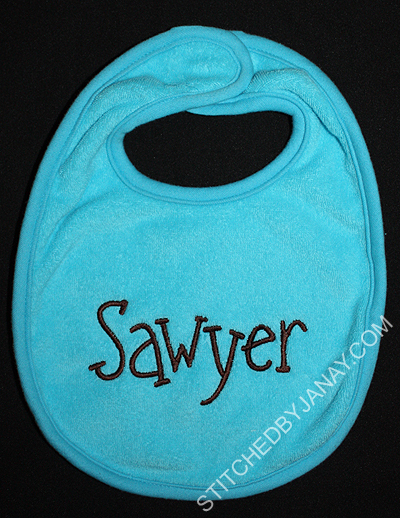 There is also a boy version and a gender-neutral version. They are all so cute! 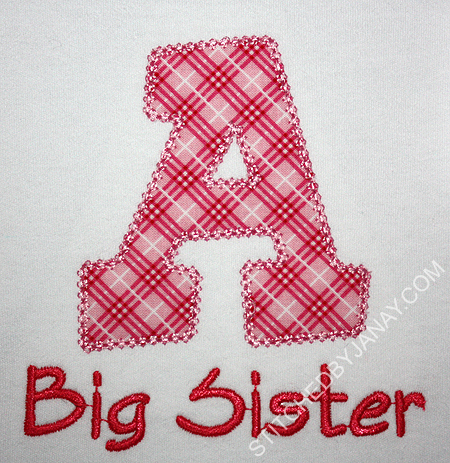 Now, please pray for my friends -- for a safe delivery, a healthy baby girl, and that the adoption process goes smoothly! A few days before Christmas a picture popped up in my Facebook feed that really intrigued me. 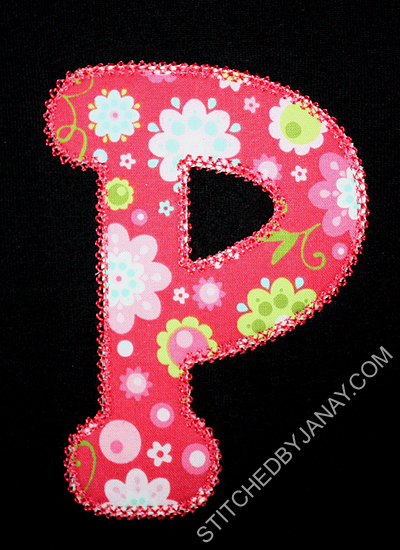 I quickly purchased the Applique Script Alphabet once Hang To Dry Applique released it, and finally today I got around to using it!! This alphabet is really neat. 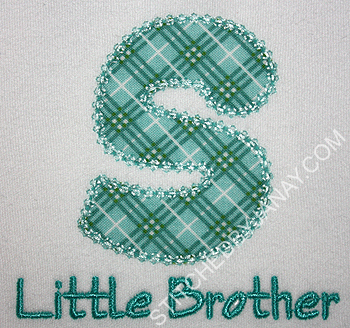 The letters are individually digitized with gaps so that when you merge them together in software it creates the appearance of a continuous stitch. 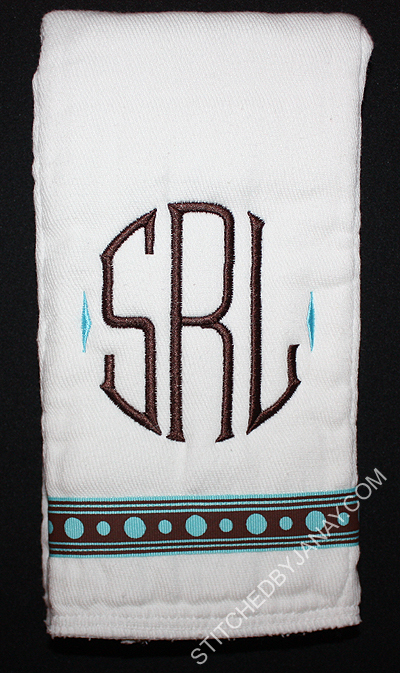 Since it's a simple running stitch for placement and a triple bean stitch for tackdown, it can be resized. 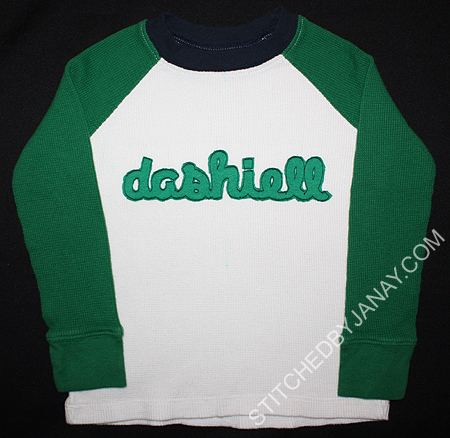 Dashiell has such a long name--I had to shrink it to 77% to get it to fit on his shirt, and it stitched just fine! 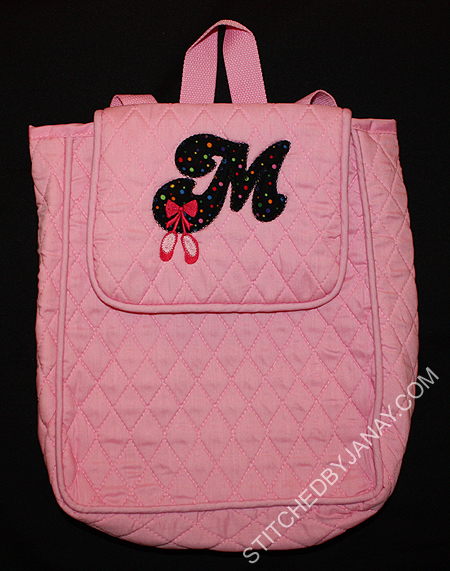 But I felt like the details needed to be trimmed more. 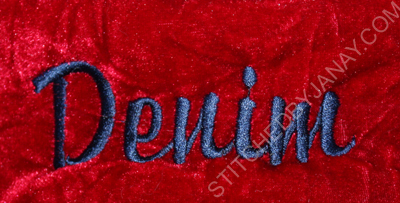 The openings inside the letters are small (especially since I reduced it in size) so some of them are just tiny slits. But it makes it look more legible. And confessions of a cheap mom... 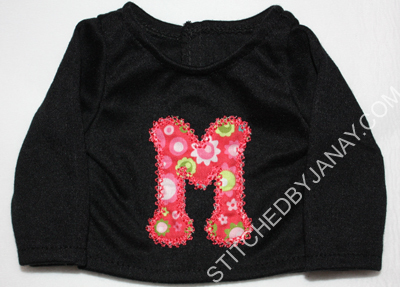 I finally joined Applique Forum (which I'm really enjoying!) 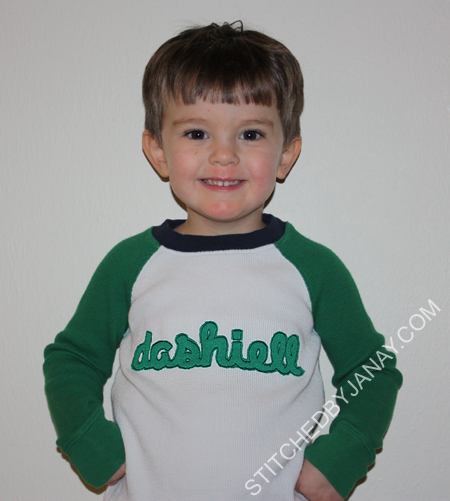 to get a coupon code for the design set, this shirt was a free hand-me-down, and I used a scrap of knit left over from making Dashiell's birthday shirt. I really like the look of this and I'm anxious to play with it more! Annaliese attended a birthday party yesterday so I whipped up a little gift. 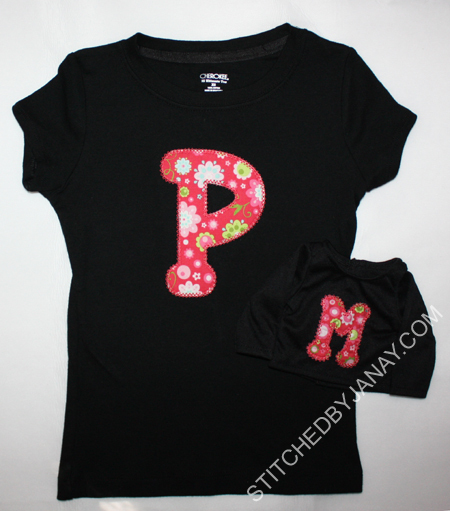 Presley received an American Girl doll for her birthday, and we took matching monogram shirts!